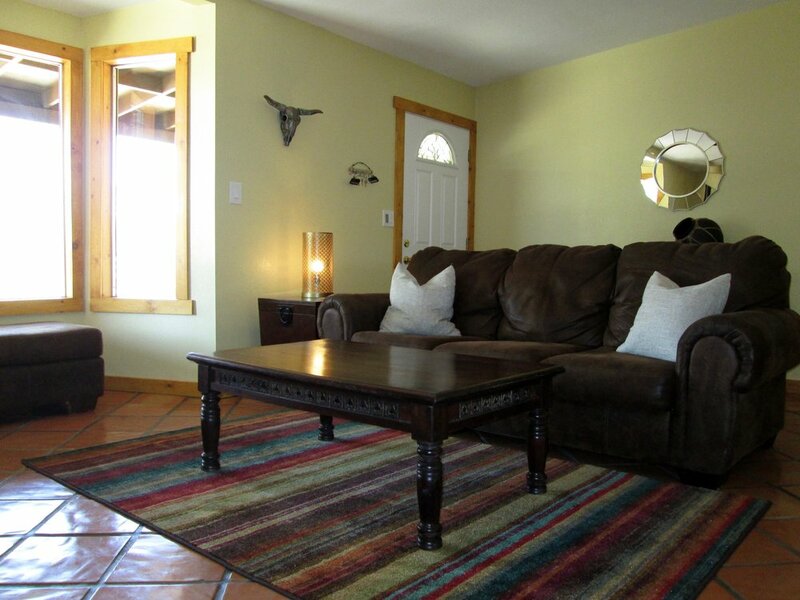 Joshua Tree Retreats of Indian Cove is a fully furnished three bedroom, two bath home with a two-car garage. Situated in a premier neighborhood of 29 Palms just outside the National Park this split-floorplan home is tastefully decorated and arranged with comfortable furnishings. Inside luxuries include vaulted ceilings, oversized laundry room, master suite with AC/Heater climate control system and spacious interior. Outdoors you can relax under an incredible 600 square foot patio or enjoy the park like setting of this one-half acre fenced property perfect for privacy, children, and pets. The home sleeps up to 8 guests making it perfect for families coming to explore Joshua Tree National Park but lacking the means or desire to camp. With three bedrooms and a sleeper sofa, everyone has a space to relax and sleep comfortably. Stylishly decorated with a rustic flare you'll find all the comforts of home. A thoughtfully outfitted kitchen is popular with guests looking to prepare dinners or pack picnic lunches. Researching activities or those on a working holiday have available WiFi. Sports fans, wind-down time for the kiddos, or sour weather can have you watching one of the three Flat-screens Televisions with DirecTV. Rain or shine our outside patio is large and set to entertain with TV, pool and poker tables and patio seating for six. After excursions, relaxing around the wood burning stove with cocktails and stories is a great way to end the day. Located in Indian Cove off of a paved road the home is situated on a fully fenced one-half acre providing an added buffer to the already peaceful neighborhood. The outdoor space if often in bloom with cacti and trees bringing in Hummingbirds, Roadrunners, Orioles, Doves, Quail and other wildlife. The landscape allows for kids and dogs to play safely and includes a Horseshoe set, KUBB, and Bocce Ball games for guest enjoyment. When sun sets you can enjoy and old-fashioned camp fire with log seating for roasting marshmallows while gazing at the starry night overhead. Escape to the JTNP boundary just over a mile south with the popular Indian Cove Campground just 3 miles up the road. Once in the park be sure to explore Rattlesnake Canyon, have some rock climbing adventures or hike through the Wonderland of Rocks. Rated one of the best hikes of JTNP, the 49 Palms Oasis Trail is just a 5 minute drive to the east. When staying in the Indian Cove Estates, you're sure to have easy access when traveling to either the Joshua Tree NP West Entrance or the Twentynine Palms North Entrance, both equidistance away. With 2.6 million visitors projected for 2017, the North Entrance is becoming the insiders tip for shorter lines for getting into Joshua Tree National Park. Twentynine Palms is a treasure trove of activities and things to explore. Sky's the Limit Nature Observatory showcases FREE (donation based) Astronomy many Saturday's throughout the month or take a self-guided tour of the Oasis of Murals, a city highlight. The surrounding 29 Palms area features eateries, art galleries, community pool, skate park, theatre and grocery store conveniences just a few miles away. The towns of Joshua Tree, Yucca Valley and Pioneertown all host a variety of activities, events and music venues all within a short drive. "We found this house to be perfect for our visit. Our family has rented one or two places a year through VRBO for the last 12-15 years, and this was one of our favorites. The owner was very friendly and very helpful with advice about the area. The kitchen was the best equipped we've found in a very long time. We've come to a number of VRBO houses or condos that advertised that they had a fully-stocked kitchen, but these owners must be people who don't prepare anything but breakfast cereal in their kitchens. This kitchen was great! A choice of sharp knives and cutting boards to choose from as well as lots of choices for pots and pans. Everything we wanted in a kitchen, including coffee beans and a coffee grinder for our stay. The house had a nice, open adjacent dining room and living room area with comfortable, inviting furnishings. The big back yard area also very nice, and the owner had provided several different games. After long days of hiking in the Park, we enjoyed relaxing while playing pool on the covered patio area." "Susan was wonderful to work with and very understanding of military families as we wait for housing on base. Highly recommended!! " "Joshua Tree Retreats is convenient inside and out. The home is stocked with more than any other rental we've stayed. A full kitchen with anything you'd need to prepare a nice meal. The patio is a great space to hang out after a day in the Park playing pool, poker or by the fire." "This is an exceptional spot with an exemplary host. Perfect location to access Joshua Tree. The house is comfortable and inviting. Highly recommend." The house was beautiful, clean, comfortable with so many amazing things to do right at the house! We barely left! Our three kids had an amazing time. Would for sure come back! "While we have friends that still enjoy camping, we are in dire need of conveniences. Internet, a hot shower and a place to cook a meal makes Mamma happy. This house hits the mark and more with super cute decor, comfortable beds and has everything we needed for our family vacation. We joined in some campfires in Indian Cove but was able to put the kids down at a reasonable hour. It's been declared, you won't see me in a tent in Joshua Tree again!"